Welcome to March 1, a day with much significance for farmers. March 1st is the deadline for farmers and fishermen to file their income tax returns and pay their taxes if they want to avoid an underpayment of estimated tax penalty. While this deadline still holds for federal taxes the year, the Iowa Department of Revenue has extended the deadline to April 30 for Iowa returns and taxes. Because April 30 is a Saturday, this means a May 2 deadline for farmers to file their Iowa individual tax returns for the 2015 tax year. This last minute extension was implemented while wrangling over potential Iowa coupling legislation continues. You can read more about this issue here. 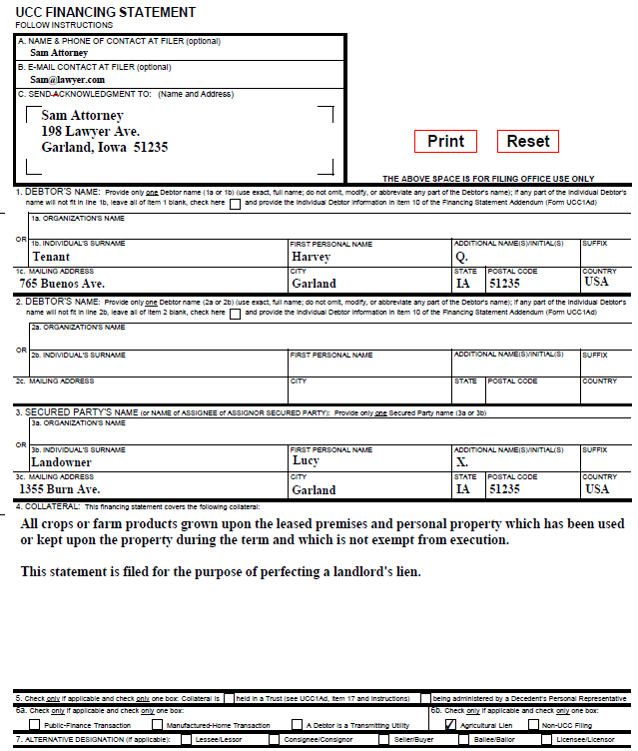 March 1 is also the day new farm leases begin in Iowa, a day to start fresh. This means that a lien automatically attaches to the farm products grown on the property by virtue of the landlord leasing the property to a farm tenant. The landlord has a statutory lien by operation of law. This does not mean, however, that the lien is perfected. Only a perfected landlord's lien is prioritized ahead of other secured or lien creditors. In other words, if the UCC-1 is timely filed, the landlord’s lien will have priority over a conflicting security interest of a bank that was perfected prior to March 1 and an ag supply dealer lien perfected before March 1. Under the statute, only a properly perfected harvester’s lien or a commodity production contract lien would have priority over a landlord’s properly perfected lien on crops. But remember, this special priority is only available if the lien is filed at the time the tenant takes possession or within 20 days after the tenant takes possession of the property. File standard financing statement (UCC-1) with the Secretary of State. Instructions for filing this form online can be found here. It costs just $10 to file the UCC-1 to perfect the lien. According to Iowa Code §570.1, this financing statement is effective "until the termination statement is filed." Because Iowa Code §554.9515 requires a continuation statement after five years for security interests, however, it may be best practice to file a continuation statement after five years if the landlord's lien remains in place. This may help avoid confusion or disputes. Although a perfected lien does not guarantee that a landlord will recover his payment due (bankruptcy, for example, can throw a wrench into the recovery), it does provide the maximum legal protection available to a landlord.